Symantec’s EMEA comms leader Caroline Dennington and recent Gartner alum Samyr Jriri gave an impressive presentation at the Analyst Relations Forum 2014 about analysts’ impact on sales. Context is key: analysts are increasingly stretched, something reflected by the increasing frequency with which some firms are taking complaints to Gartner’s ombudsman, and making similar appeals at other firms. 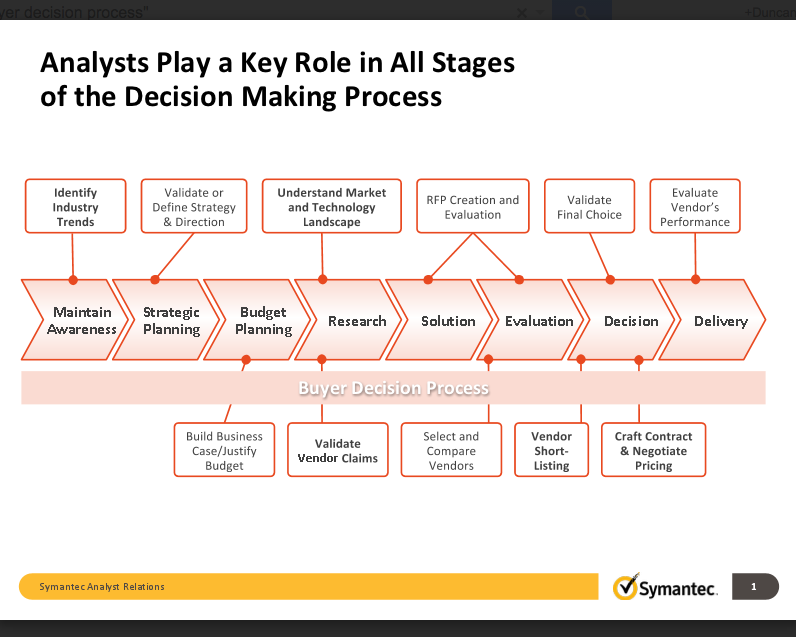 Dennington, who previously led Symantec’s global AR, explained that few AR people ask which analysts are really reviewing RFI and RFQ documents from customers, and getting more visibility into analyst impact allows firms to focus on developing closer relationships with top analysts. Analysts have a lot of flexibility, and often will recommend firms both inside and outside the Leader Quadrant: often quite unexpected firms can be added into consideration by analysts, even late in the process. In the session, the speakers had an interactive discussion answering many pointed and specific questions from AR leaders about how to make the most of analysts’ influence from day one through the deal cycle. One fascinating example picked up on Gartner Consulting, which has been involved in a deal where the relevant analyst is not involved in a relevant project: actually led by a consultant who that not so familiar with the market. Similarly to Gartner Consulting’s insulation, Gartner also has a focussed group of analysts dealing with the investor market. They are often quite distant from the product analysts, and can usefully be a target for investor relations professionals. Gartner is also using ‘stringers’ who are not tenured analysts. but can be influential. Vendors’ ability to help Gartner is limited, and many firms shared the frustration that Gartner does not interview, or even attempt to contact, all the customer references. If analysts are committed to using customers fully, reference-chasers at Gartner (In Europe that’s Sally and her colleagues) can have a lot of influence on the research direction. Flagship research like the Magic Quadrant and Forrester Wave are often painful. Thankfully Forrester’s new automated tool for the Waves, which is now in beta, also tracks customer references and shows whether and when your customers were contacts. Jriri, now a director at Kea Company, also stressed context. He gave several powerful examples of analyst influence on sales (even one deal won after the vendor took Gartner’s advice to quadruple its prices) and stressed the fact that few purchases are influenced onlyby research. Analysts put their research into context, and buyers use multiple forms of research. He emphasised the complexity of Gartner in particular, and how few consultants and analysts will proactively reach out to clients or colleagues. The different people at Gartner following your market need to do their siloed job, and often only your client service rep will help you to navigate internally. Often Gartner analysts are rather uneven in their motivation, or ability, to connect with (or even find) Gartner consultants working on deals in the analysts’ market. There was a vibrant discussion about how independent and impartial advisory and consulting specialists can be. Some firms have a noted reputation for independence, however other advisory teams are less transparent. As Ed Gyurko noted, advisory consultants are quite generally less transparent than industry analysts. Samyr broadened the context to talk about influencer relations, making it an astonishingly broad session which also drilled down into a lot of specifics. To find out how analysts can help your firm to accelerate the sales process, please contact Samyr. This post originally appeared at InfluencerRelations.com.